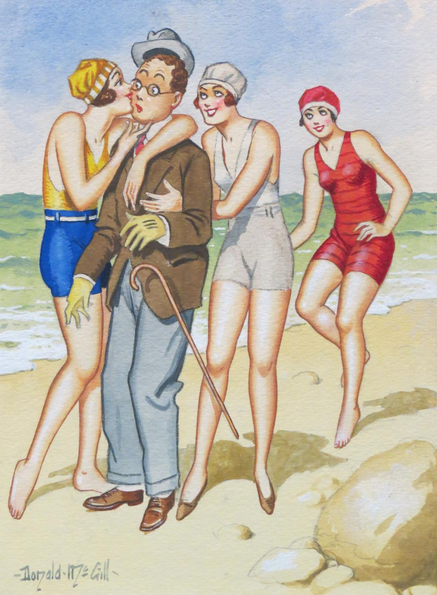 As well as Donald McGill's saucy wit, the sale also features exquisite original watercolour paintings from which the postcards were produced. There is only one original of each of McGill's watercolours, Campbells' sale will feature sixty of these paintings by Donald McGill which are estimated to fetch between £400/600, with some notable exceptions that are worth more. 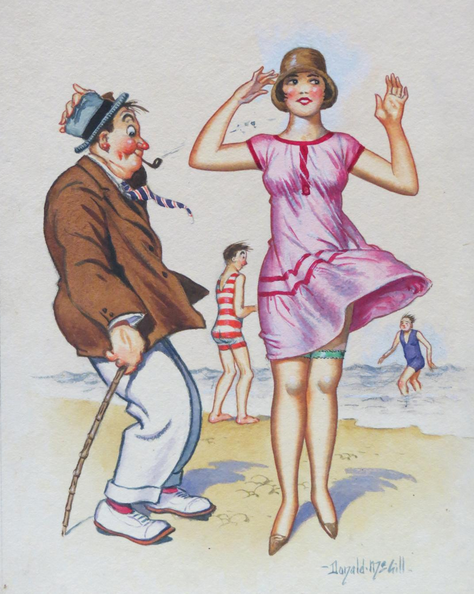 McGill, 1875-1962, was a respectable Victorian gentleman, whose postcards sold in their millions at Britain's holiday resorts for six decades in the 20th century. It became an essential part of the British holiday to pick up an amusing souvenirs in the form of a McGill's postcards. The first cards were issued in 1904 and they continued into the 1960s, it is well known that McGill spent his last year at his easel creating paintings for the next holiday season. McGill recorded all the wondrous developments of the 20th century, as inventions were being produced at such a speed that had been unknown before this time. Automobiles, traffic lights, technicolour cinema, McGill captured these fascinating parts of human history that are today taken for granted. A painting by McGill which is expected to reach four figures is the piece which features a Brit slinging a ball of mud at Hitler, with the caption "Well, Have this bit with me, Adolf!" With printers subjected to severe paper restrictions during the war, this painting is believed to have been painted before war was declared, perhaps summer 1939 when the country was becoming aware of the rumble of war across Europe. 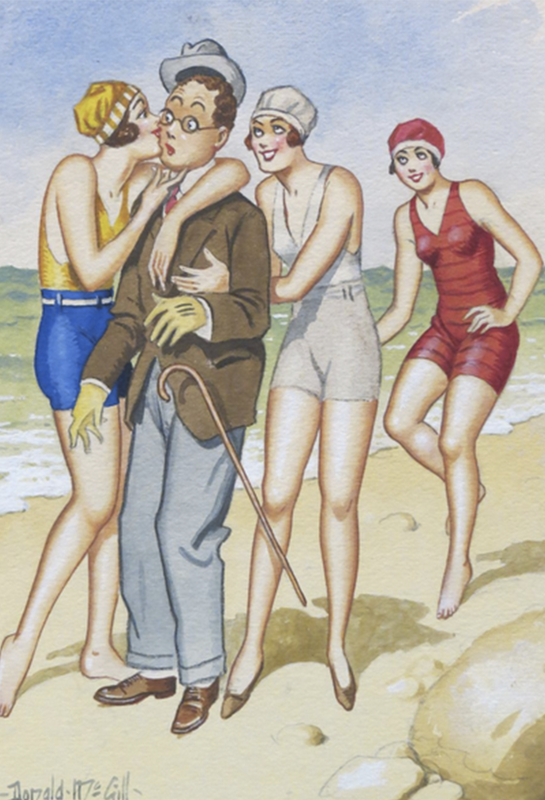 The sale also includes some sixty works by other talented postcard artists, who became known as the "more obscene imitators." Donald's reputation was tainted as being ''obscene'' as he grappled with the prevailing literati mood In 1954, Britain's morals were brought into question by Parliamentary Select Committees. Censor Committees were invoked at places like Isle of Man, Hastings and others, in addition to Cleethorpes in which censorship of the arts was stepped up a gear, a move which divided the nation. Orwell famously wrote an essay on this censorship, in which he featured McGill's works. Orwell saw McGill's art as a "chorus of raspberries' in the face of Victorian pomposity. The auction takes place fittingly at sunny Worthing on 9th September 2015, where Donald McGill's cards were once purchased and posted from.